“I’ve been attending CUUC with my husband for 13 years, and we knew from day one we belonged here. If I had to sum it up in one word: acceptance. The acceptance we’ve found here fosters a sense of community many of us lost when we opted to leave the religion of our upbringing. It’s not just tolerance; it’s being part of a spiritual family. It’s genuine acceptance.” ⁓ Maxi F.
If you are looking for people who share a common curiosity, a desire for spiritual direction, and a commitment to our planet and all its inhabitants, you’ll find them here. If you are looking for a congregation of seekers who come from a variety of religious and philosophical backgrounds – Catholic, Jewish, Protestant, Buddhist, agnostic, atheist, humanist, and others – you’ll feel right at home. All are welcome here, without distinction of race, class, gender, or sexual orientation. Interested in visiting and need a ride? Please contact Jane Dixon at lilrhodie@gmail.com -- she will try to find one for you. Our nursery is available for children not participating in a religious education program yet. Worship activities vary on occasion in order to celebrate traditions and reflect on our beliefs together. For more information about us as Unitarian Univeralists, check out our seven principles and six sources. You can find more in depth information at our denomination’s website, uua.org. When you visit, chances are you'll be treated to music by concert pianist Adam Kent, our Music Director since 1990. Adam Kent collaborates with CUUC's Choir, directed by Lisa Meyer, which performs twice a month. Programming is eclectic and generally in keeping with the themes of the services. 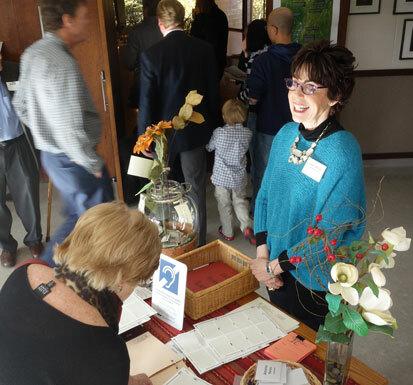 We’d like to make your first visit to Community Unitarian Universalist Congregation as easy as possible. 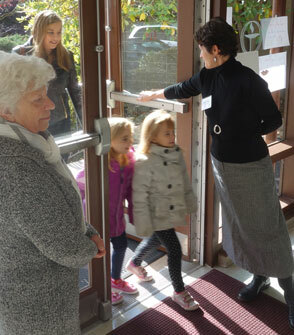 On Sunday morning greeters welcome visitors and are available for help with both adult activities and children/youth religious education. Visitors are provided opportunities to meet others and learn about CUUC in a variety of ways including during coffee hour, in a meeting after service on the 3rd Sunday of the month, and at receptions at the minister's home. The building is wheelchair accessible and the sanctuary has an infra-red sound system for the hearing impaired. Feel free to email Jane Dixon from our Welcome Committee: lilrhodie@gmail.com. Summer Sunday services feature guest ministers as well as lay-led programs and offer an informal atmosphere for continued worship during the summer months. Our Fellowship Hall is air conditioned and childcare is available (there are no religious education classes during summer months).